Always exciting when there's a New Kid On The Block, esp. so in this case when there's a whole new block, full stop. 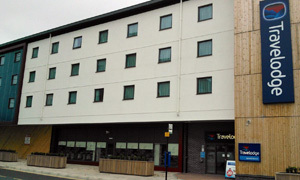 What was once an unremarkable and poorly surfaced temporary car park next to Bargain Booze -- and which may or may not have had four small green plastic houses on it -- has yielded to, drum roll, a new hotel. Rising fairly fast on that there Duke Street, a fishbone's throw from Loch Fyne, has been a shiny new Travelodge. Can't think of too many other hotels that we've done -- maybe Milsoms? -- but this one's in 'cos that windowed area down the front is a "bar cafe". Off to a good start with a very reasonably priced Appletise from the bar, then we're presented with the laminated menu. Which is suspiciously extensive with its starters, burgers, large choice of mains, curries, pizza and salads. Gosh, they must have a shedload of grub round the back. Paralysed with options, we go for the one with the biggest picture, the burger platter for two. Right you are, says the lone serving chap, and disappears for a bit. Can easily imagine that this area might be humming for the all-you-can-eat £7.65 breakfast buffet, though just us for lunch. Bit of a chat pre-food while trying to talk over BBC's Doctors, blasting out on the wallscreen TV. Here's grub from the mystery kitchen: mini burgers, corn cobs, and a handful of chips. It's OK, much like a Little Chef plateful. Careful with those fiendish dipping sauces, Eugene. Food finished and free WiFi consumed, we hotfoot it out of there, not seeing another soul. All a bit Eleanor Rigby. And since we'd welcome some atmosphere and the sight of other folk, it's down to the waterfront to the always good Coffeelink for coffee and cake. Moral of the story: sometimes it's better to arrive than to Travelodge. If it was a car -- Morris Traveller. If they were passing by -- David Lodge.